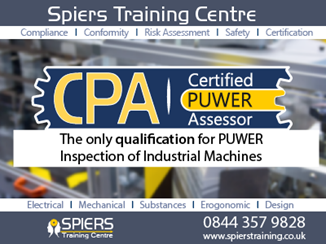 Spiers Engineering Safety offer the only qualification in PUWER Inspection and Machine Risk Assessment in the UK. It is also the only PUWER course which offers a practical element, allowing the learner to carry out an assessment on an industrial machine. PUWER ‘98 applies to all work equipment, especially mobile and lifting equipment. It applies to all workplaces where the Health and Safety at Work Act 1974 (HSW Act) applies. This qualification is designed to develop and confirm advanced level inspection skills and knowledge for the learners who have responsibilities in the workplace for PUWER inspection of work equipment. It is ideal for those with technical responsibilities in the workplace including technicians, team leaders, supervisors and health and safety practitioners.